Tom Hoins Monaghan's steady rise over last ten years was due in very strong part to Pipe Major Thomas Hoins. Born in New York, but raised in County Tyrone, Tom played with two of Ireland's best bands; Grade One St. Patrick's - Donaghmore, and Ballinderry Bridge. With such experience, Tom has been looked upon as the elder statesman in Monaghan's formation years despite his young age. Tom took over the band in the fall of 1992 and has brought it a long, long way. He has shaped the band with his teaching wisdom, and molded its character with his patience and even temperment. In Monaghan's seventy years, Tommy is the first pipe major to bring the band all the way to grade three. 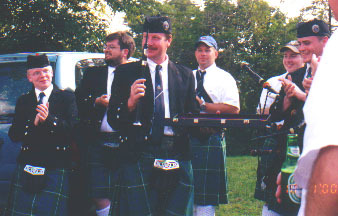 Tommy gave up the pipe major reigns in the fall of 2000 to bring John Wassman aboard. Tommy continues to serve the band as part of the backbone of the pipe corps. 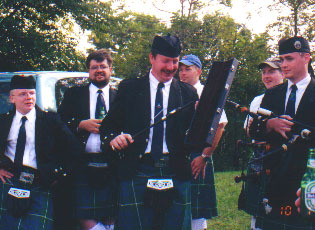 Bethlehem, PA, 2000 Above and below, Tom is presented with a Presentation Practice Chanter from the band, in recognition of his years of service as pipe major.